The Micro Machines series is known for being some of the best party games of all time. The series took a bit of a break after the PlayStation 2 installment back in 2006, but now the classic racer is finally returning. I had the chance to speak to Gavin Cooper, Chief Game Designer on Micro Machines: World Series. Read on to find out more about bringing Micro Machines into the present day, the chance for a Nintendo Switch version of the game and more. Could we get you to introduce yourself to our readers, please? Sure! My name is Gavin Cooper, and I’m the Chief Game Designer on Micro Machines: World Series. As you are aware, a lot of time has passed since the last Micro Machines game. What change in gaming has made the biggest impact on the development of a new Micro Machines game? Probably the biggest change is the degree to which online gaming has taken off. Online play has made it possible to easily get a larger number of players playing together. In larger games, it’s harder for a single person to “win”, which I think is at least partly responsible for the explosion in team-based games. And with team-based games, we’ve seen the diversification of play – when there’s a team objective different people on a team can help achieve that objective in different ways. All of those are things that have helped to inform the design of Micro Machines World Series, especially with respect to the new battle modes. One of Micro Machines 2’s best features came from the local multiplayer options. Will there be an emphasis on local multiplayer in this game? Local multiplayer is definitely a big part of the Micro Machines experience, with the game offering both Elimination and Free-For-All modes for up to four players locally. There are also a number of options that players can use to tweak the game – you can choose to have AI bots on or off, modify players’ health and so on. You can even play these modes on your own against the AI. And all these local multiplayer modes can be played without requiring a network connection. Anything involving weapons in the Micro Machines series always seemed to be hit or miss with some fans. What has been done to make the weapons more enjoyable this time around? The biggest change is in the game’s all-new battle modes. In these modes each car has its own unique roster of weapons and abilities, meaning each car plays differently. In a team-based game that gives players a lot of scope to explore synergies between their car and those of their allies, and counters to the line-up of cars being fielded by the enemy team. You can pick cars that suit your style of play – defend the flag with Jack Hammer’s dumper truck or keep your team’s health topped up as you assault the enemy with Dr Mel Practice’s ambulance. All in all, there’s a lot for players to get stuck into, and it’ll take them a while to master them all. And in races, where power-ups have been part of the formula since Micro Machines V3, players will be able to collect pick-ups in order to unleash a range of NERF power-ups against their opponents. But if you’re a fan of the earlier games, before power-ups were added to the mix, don’t worry! Race power-ups can be turned off in local multiplayer if you choose (and will also be turned off in some scheduled online events) so you can focus on pure racing skills. The use of the Hasbro license in this game looks fantastic. Was there any particular property you were excited to combine with Micro Machines? There were a couple that I personally enjoyed a lot. Being able to drive around on the Hungry Hungry Hippos board and avoid getting chomped just excited some deeply buried childhood bit of my brain, as I used to play that game against my three siblings all the time when I was a kid. But possibly the most enjoyable bit was getting to play with the G.I. JOE vehicles. Dreaming up weapons for them to use, dressing them up in cool customizable skins inspired by the history of those vehicles, and then having them voiced to evoke the characters from the cartoons… that was a bit of a nostalgia gold mine! What has been the biggest challenge in reviving this classic series? I think the biggest challenge has been making the game relevant to a modern audience. We didn’t want to just make the original games again – people have already played those (a lot)! 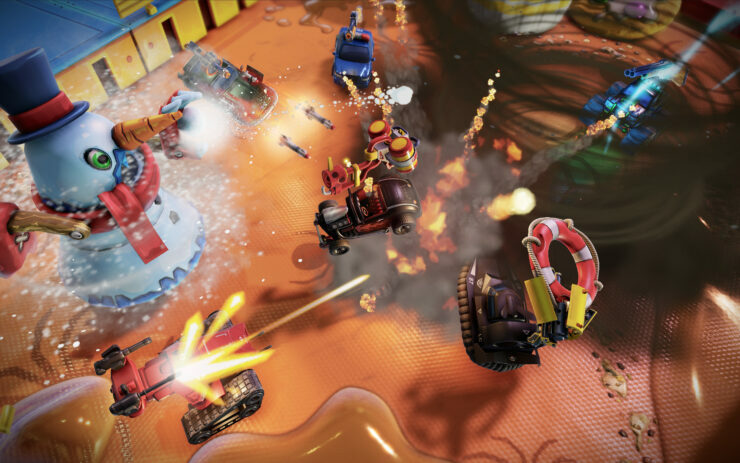 We wanted to make a Micro Machines game that offered that core Micro Machines experience, but one that also delivered the kind of depth and complexity that a modern gamer would expect. A persistent progression structure, so you can feel like you’re working towards something. Modes that let friends play cooperatively (on the same team) instead of always having to compete against each other. Vehicle interactions, synergies and counters, for players to explore, learn and master. Ranked play with season prizes. Global elite leaderboards. Vehicle customization. A schedule of special events. And more! I noticed the classic Micro Machines characters are back in this game. Will Violet Berlin be returning to series? Violet Berlin is indeed present in the roster (she was kind enough to give us her permission to bring her AI avatar out of retirement!). As are the other fan favorites such as Spider, Dwayne, Cherry, Jethro, and all the rest! Toybox Turbos supported VR on the early Oculus Rift headsets. Is there a chance Micro Machines: World Series could receive VR support in a patch down the line? A lot of development teams are interested in VR, and we know the top-down nature of Micro Machines would work really nicely. However, there’s nothing we can announce at this time as our focus is on finishing this version. Will you be supporting 4K and/or HDR in Micro Machines: World Series? We’re not supporting these features at this time. The Nintendo Switch seems like the perfect fit for a game like this. Is there any chance we may see a Switch version in the future? Micro Machines: World Series is scheduled to release on June 30th for PC, PlayStation 4 and Xbox One.